A three minute pain-free abortion, and you can drive yourself home. 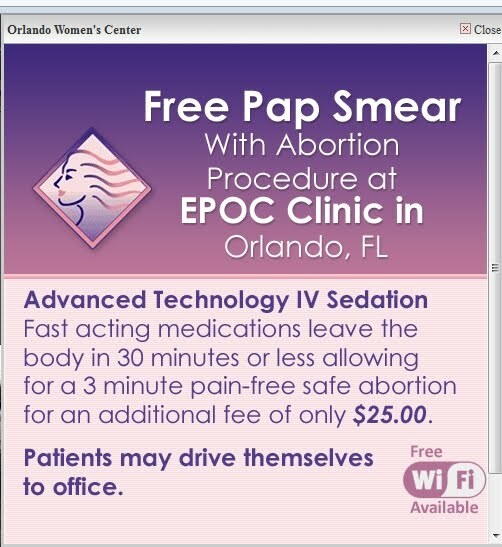 Plus a free pap smear! Is that a way to perform and market abortion? At the Morgentaler clinic, the staff will turn you away if you are driven and don't have your driver with you. Even if your sedation wears off in thirty minutes, is it such a good idea to be alone during your abortion? What if you hemorrhage? I can just imagine one patient photographing another with her laptop while she's not looking and posting it on her facebook. Weirder things have happened.